As the market becomes more supportive of entrepreneurial efforts, more emerging small businesses will be more likely to reach a prototyping stage. Similarly, larger organizations will continue to push the envelope in the manufacturing of products. We pride ourselves in assisting both large and small businesses with not only the ability to produce single-item prototypes for volume production, but also engineering support service to help with the development of their designs. By aiding in the final design when required, we can help customers save weight, time, and money by optimizing product specifications. When our customers come to us for a prototype, it is often accompanied by a strict time requirement due to the nature of prototyping itself. As a result, turnaround time is especially critical in the prototyping stage. We can offer prototype Swiss precision CNC machining with our 2-8 week manufacturing lead time, we can produce nearly any machined part prototype our customer can design in a very short time frame. Reducing the prototype window even further is our ability to print a prototype of a design very quickly on one of our 3D printers. 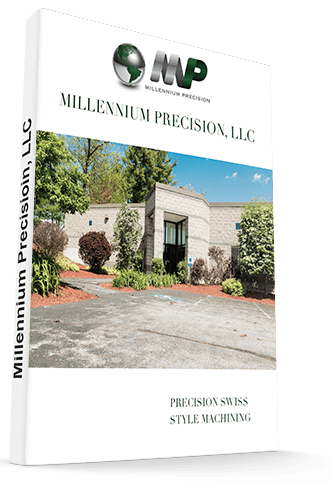 Here at Millennium Precision, we have the capability to turn nearly any CAD file into a product. The combination of our CAD and production capabilities sets us apart from other manufacturing plants. Whether the prototype is plastic or metal, is twelve feet long or thousandths of an inch, we have the capability to produce it. When the prototype evolves into mass production, our customers needn’t worry; we can support production runs between a single prototype up to 100,000 manufactured parts. With some of the best quality control standards and an ISO 9001:2015 certification, our customers know that if mass production becomes feasible that they can trust us to deliver a product on time, on a budget, and with amazing quality.